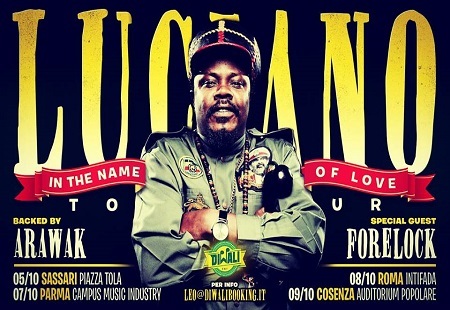 Luciano aka The Messenjah returns to Italy with the tour "In the name of love". Four dates that will see him engaged in various cities of Italy with the support of a great italian reggae band: the Arawak with the singer Forelock that will open the show. Torna in Italia con il tour "In the name of love" Luciano aka The Messenjah. Quattro le date che lo vedranno impegnato in varie città d'Italia con il supporto di una grande reggae band: gli Arawak capitanati dal singer Forelock che aprira' gli show.